Join Poppy on her adventure around the world as she dances with animals from Australia to Thailand, Scotland to Brazil, India to Russia and many more wonderful places to prove to her brother that Animals Can Dance. Born in 1981, and growing up in the northern suburbs of Sydney, Lee Keenan has always had a passion for children's literature. Her collection of children's publications reaches into the hundreds. Having complete a Bachelor of Education (Early Childhood Education) in 2003 from Macquarie University, she spent 15 years in the Early Childhood Industry working with children aged 0-12 years. In addition, Lee has completed a Diploma of Business Management and a Diploma of Children's Professional Writing (Children's Writing and Publishing). She also started her own business in 2013 creating online educational materials and teaching resources in an effort to assist educators to extend on children's learning. When Lee isn't working on her writing, you can often catch her cooking, running or hang out with her husband and two kids, causing all sorts of fun and mischief. Question: What inspired the story of Animals Can Dance? Lee Keenan: My family were driving to the zoo, and my five-year-old daughter Abigail was itching to see the elephants. She wanted to know what country they came from and we showed her a picture of the Thai elephants on my phone – to which she exclaimed 'they look like they are dancing". My accountant husband responded flatly and firmly that 'animals can't dance" to which my five year quite adamantly replied 'no dad…animals can dance!". 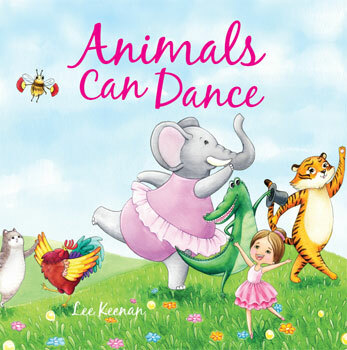 Lee Keenan: The inspiration for the main character Poppy, is based on my daughter's love of dancing and reading, and her true belief that animals can dance. Question: What is the best thing about creating a character like Poppy? Lee Keenan: The best thing about a character like Poppy is being able to showcase her determination in what that she believes. My own daughter truly believes what Poppy believes too! Which is fun! With Poppy travelling the world we all get to see other countries, their national animals and traditional dances – which I hope is relatable AND FUN for children everywhere! I have completed another manuscript for a children's picture book which I hope to bring to life soon. As an early childhood teacher originally, I will continue to create and develop teaching resources for the early childhood sector, with a focus on school readiness.